Editor’s Note: Every other month, we publish the profile of a member of Doody’s Library Board of Advisors (LBA). The LBA has guided the development of our company’s library services since our inception. 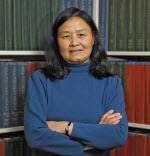 With gratitude, this month we present the profile of Jie Li of the Biomedical Library of the University of South Alabama. My interest in medical libraries started when I worked as a library assistant in a small Health Services department library at the University of Washington where I was a library school student. The librarian there assisted the faculty of the department in obtaining many grants. The faculty felt the librarian’s work was valuable and funded the library completely with grants. I started working at the University of South Alabama Biomedical Library in 1992 as an information services librarian. Since then, I have held positions as a hospital librarian, an assistant director for public services and education, and now as the Assistant Director for Collection Management. When I started here, the library collection was 100% print. The library was one of the first to embrace electronic collections starting with MDConsult. Over the years, the library’s collection has shifted from print to electronic and is now about 98% electronic. Librarians should demonstrate and promote their value to their institutions. Like the librarian I first worked for, the faculty valued her work so much that they were willing to use part of their grant funding to support the library. We must show the institutions our work is worth their support and funding. Librarians need to adapt new roles in the ever-changing information world. In the print era, librarians’ roles were centered around the preservation of books and journals, making available the knowledge in those books and journals. The changing roles of health science librarians include, but are not limited to, embedding in classes and clinical settings, serving as specialists in informatics, supporting the development of systematic reviews, continuing education, scholarly communication, and working on data management, outreach, and consumer health. Only when we adapt to new roles, will we be valuable to our institutions. I volunteer to serve on the Doody’s Library Board of Advisors because I believe Doody’s products provide essential, excellent, and high-quality services for librarians. Doody’s Core Titles and Doody’s Review Service are essential to collection management for selecting monographs. Doody’s Collection Development Monthly Newsletter publishes reviews of databases, not only providing evaluations of databases librarians are familiar with, but also introducing new databases to librarians that they may have not had an opportunity to examine personally. When I developed LibGuides for our clinical departments, I relied heavily on Doody’s Core Titles (DCT). Many of the titles in DCT coincide with received faculty recommendations. Using Doody’s services helps librarians and libraries better develop and manage their collections.